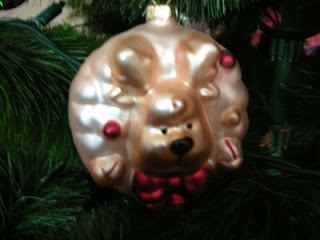 I have a very weird quirk, I love these blown glass Christmas decos'. 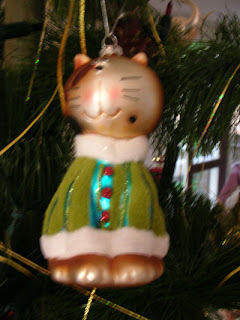 All shapes and sizes are on my tree. 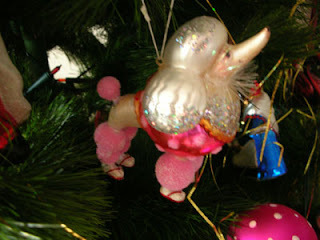 Some are so tacky you just have to love them. 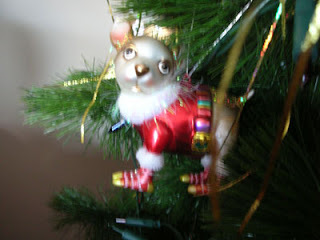 If you can't love a bit of glitz at Christmas when can you? 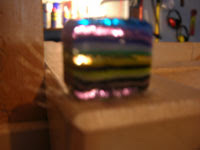 Images are still a little blurred I will get the other camera and take some more later. Merry Christmas every one. This is a bus shelter Julie Ryder produced for Domain 2007 in Canberra. The shelter was in Alinger ST civic, Julie and fellow artist Sara Freeman were interviewed on The Program. Here is a link to the interview, The Program . There are images and a link at the bottom of the page to the Audio interview. 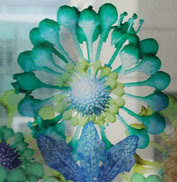 Julie is an amazing artist, a mentor and friend, as a textile artist she has an amazing affinity with colour and pattern. Colour and pattern always inspires me, after so much white weaving colour is next on the loom. Anyways, I will be sure to blog more now - I promise! I love this little piece of glass. It is an off cut of some work my friend Lucette made. It move from the studio to my garage on the loom ( stuck with bluetack) so I guess it's there to stay. Well today has been a short day. 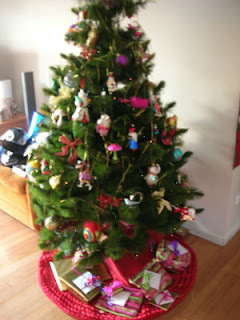 Yesterday I returned from Melbourne, after a little rest I was into it, house work that is. So after a sleep in I went into the garage and started on the loom. with lots of intervals of lawn mowing, wash etc. But the loom is now ready to go!!! My friends delivered an old floor mat for me to put down under the loom so I will con a few people into helping lift the loom and sliding it under. Hopefully that will be tomorrow. I can now start to weave my blankets, I hope they are well received or family will be getting them for Christmas. I hope to spend a day with Mel this week and do a little dying of Mohair. I am still procrastinating over simple things but I feel if I get at least this warp woven it is only 5 mts longs so should not take to long and them I can do some real stuff. The fluro wire is waiting. My daughter Lauren took some photo's of me threading and I took a few as well so there goes. Lets see if I can get them to load to the bottom of the post. Nope just went to the top again. I received this image from my friend Carly. Carly is a textile artist studying at RMIT Melbourne and working with fellow artists on animation and these are some of the caricatures Carly has made for the production. I just love the image and had to share it. Mel and I caught up for a quick late lunch yesterday. Avi Amesbury my work colleague and I had been to Sydney to visited the Smart Works exhibition at the powerhouse museum. 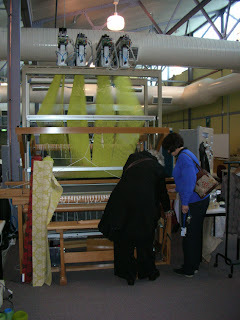 A very interesting exhibition of Australian and New Zealand craft and design practitioners. On our way back from Sydney we stopped to see Mel and visit Sturt Gallery in Mittagong. Over lunch Avi made the comment that I procrastinate, now the debate started, was I or Mel the worst procrationator? I say Mel but of course I would, but it has me thinking why do we procrastinate and is it procrastination if we think about projects and mull them over in our minds but not put into a sketch book or diary? If projects take longer than others to materialize or we think, mull, think and decide that is not the road to travel is that still procrastination? I have to say I do procrastinate but why?, is it because I just am not interested or I don't know which way to go to produce an idea. I keep thinking that I should draw more. My visual diaries are always filled with text not drawings but is that not a way of drawing any way? I always feel intimidated as there are many wonderful textile artists out there and I am not in that league. So today--- I have started some new drawings in my diary, I have wound a new warp on my small loom, I have taken some images from old weavings so I can play in photoshop. So today I am not a procrastinator!!!!!! My other thought for the day is, Is having a dead line eg: assessment or exhibition opening a way to make you develop ideas and get on with it or will we still procrastinate until due date is approaching? Maybe study is a way of keeping going and not procratinate, so is that my answer do I need to do more study (maybe think of my MA), find a topic/subject research and make/produce a body of work and there you are, lots done and hopefully no procrastination. The above image is one of today photos and now I have to work out why they always go to the top of my post and not where I insert them. Rainbow wools is an Australian yarns supplier. The serves is wonderful and helpful. The companies owner, Carol will source yarns if possible for you and is very helpful with any enquiries. I just love the new little Ashford table looms they stock. Just quickly, my latest project is working with Fluro Wire. I am trying to weave this for an istallation with the FyberMotion group. I have also been working on a new production range of bed runners, in mohair, now that's a challenge and a hard, when every time I use mohair I start to get hayfever but it is such a wonderful fibre I have to use it. Rainbow Yarns. 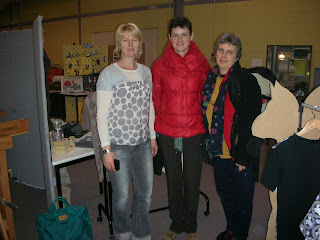 Last Saturday I was asked to speak at the New South Wales Spinners and Weavers Guild in Sydney. I was quite nervous, as most people are when public speaking, but I have to say that it was a wonderful day! I was so impressed by the high standard of work shown at the meeting before I spoke, and the very professional manner of the guild - it really made you want to be a part of it! I have placed the Guild's website on our links bar, so if anyone is in Sydney check out their meeting schedule - I highly recommend it. I have to say that it was truely wonderful to see so many people who I haven't seen for so long - people who have seen me grow up in textiles, people who have known me through my mother's business and people with who I have had just a brief contact with but have left a huge impact. 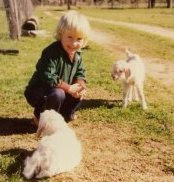 When I was still a wee bub my parents decided they wanted to live on a farm. I suspect they were also watching many episodes of the BBC's 'The Good Life' as we were soon virtually self sufficent. We also ended up with about 120 angora goats. 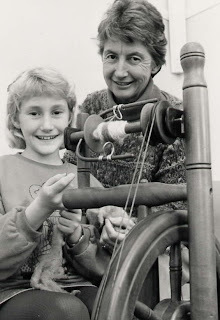 Which naturally lead Mum to spin and weave the mohair. Through an interesting set of circumstances Mum started a spinning and weaving supplies mail-order business. I was about eight then, and inquisitive so I was learning everything I could too. I also had awkward hair, and it was the eighties... and this ended up in the local newspaper. After a while Mum bought a spinning mill (factory - more on that another day) so we were producing our own yarn. This was where I spent most of my time. I learned to weave from Mum, but I learned about fabric production from old mill records given to me by the previous owner of the factory. 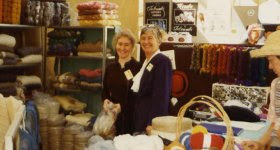 And we had stands at shows to promote the yarn (and my hair had still not decided what it wanted to do...). This photo was taken just before I went to Italy to study, age 18. And I wanted to make Belinda laugh at these silly photos! What makes our subconscious distort everyday emotions and objects into strange new worlds during day-dreams and night dreams? What process of subconscious flow creates images in our minds that can portray deep emotions or fanciful sojourns? I do not attempt to explain the functions of the process - I delight in the pleasure of using such mental meanderings by articulating them in stitched collage and weaving. Within my processes I have borrowed ideas and methodologies of surrealists – most predominately that of 'the omnipotence of dream ... the disinterested play of thought' 1. My work is not entirely true to this ideal, as I constrain myself with boundaries and objectives at the outset of the construction of the work. I always reach a point where I stop thinking about what I am creating and let my subconscious take over. The making of the work is more like a day-dream – a little control in a fanciful world. In my own dreaming, I experience recurring themes, which, when reduced to intent, can be related to desire, innocence and trickery, and growth. The patterns these themes create are not always identical but rather, are part of the distorted whole. 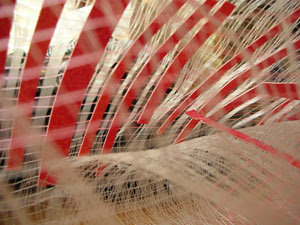 I relate this to my weaving by using separate but similar recurring patterns within the structure of the fabric. The viewer who considers the patterns notices that the repetition occasionally diverges from the expected. Often when the pattern repeats, the shading and colours change. I enjoy this as a metaphor for subconscious musings. Glowing colours and threads enhance the depth of the image and evoke the lusciousness of the mind's conceptual interior. Simple elements inspire my intuitive responses when I make the collage work. I have an initial inspiration and then try not to think about the subject further, allowing nonsensical wanderings to articulate themselves in the work from the initial ideas of object, line and colour. This gives collages that rely on the surrealist ideas of unconscious play and are pleasurable in their spontaneity. 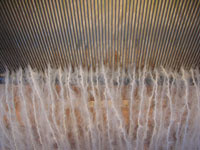 The viewers orientation is relaxed, and the viewer chooses what the subject and final meaning are. The collages are pleasurable in their spontaneity and almost nonsensical wanderings from initial ideas of object, line or colour. I try not to think about subject more than that initial inspiration while making the work. The construction is able to rely more on the surrealist ideas of unconscious play. The viewer's orientation is intended to be a relaxed one; it is entirely the viewer's choice what the subject or final meaning is. 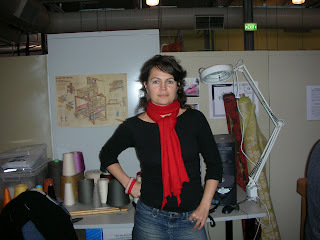 In constructing the series of scarves I wished to play more on the viewer's and wearer's idea of how a scarf should be. Instead of starting from this end point, I considered 'How would the subconscious make a scarf?' The only constraining factor of a scarf is it's usability as something to be worn around the neck. So I decided to experiment with how not to make a scarf – cutting, pulling and distorting the fabric up to but not including the point of destruction – so long as it still functioned. It is up to the wearer how they are worn. 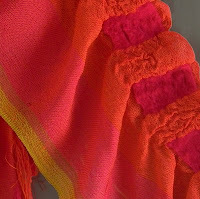 The scarves are the functional articulation of the concepts I used to create the artworks. As James Gleeson succinctly states “I've never accepted the external appearance of things as the whole truth. The world is much more elaborate than the nerves of our eye can tell us... " James Gleeson. So I encourage the viewer to consider the work inside their mind – stare at the pattern for five minutes. What does it evoke in your mind? Something, or nothing, that's ok.
Rachel from RMIT textiles, Rachel spent the week running from teaching duties to looking after us. Thank you rachel for all your help! 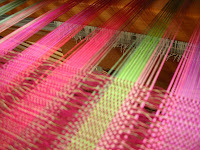 Weaving on the loom by one of RMIT students. I am not sure who but it is a very interesting piece. Cybil and Monique see what is going on in the shed. This is Rocky my dog isn't he cute? he is lying beside me now as I am writing. Eyes to melt your heart. After many months of no weaving I have started again. 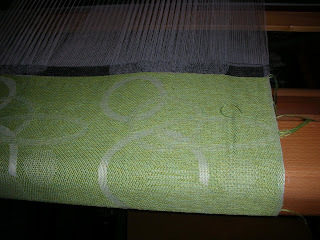 This week I wove off an old warp that had been on my small 8 shaft Tokia floor loom so about 9 months. It felt good to just weave mindlessly for a few hours. 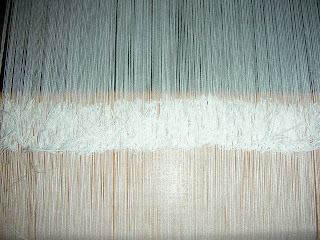 The warp was white mohair that Mels Mum sells, its beautiful and soft. I was sampling for a new range of bed coverings. Must say mohair is sticky but Mel's solution of drinking straws is great. I hate getting under the loom to tie up the treadles, its hard to climb under the looms and I always put if off. The sample produced some interesting effects and I am happy with the result, so back to the warping mill for a few hours of winding and try again maybe using all 8 shafts this time. Mel visited Canberra last week and we talked about many asspects of art with coffee and lunch at the National Gallery of Australia and visits to many of the galleries we are inspired to work together on an exhibition so think lots of colour and texture!. So its time to start some research and play with some collage. I had the most wonderful images sent to me from a friend in Florence Italy showing the new Fendi bag fabric delightful! I can't post the images as they don't belong to me. I will ask if I can publish them. Well its winter and a perfect time to weave. And I'm not. 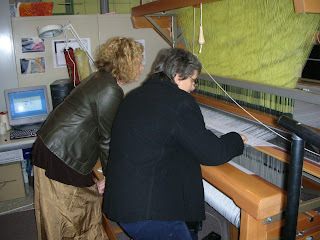 Last Tuesday I visted Mel in her studio at Sturt Mittagong. What a great day. I have been unwell for some months and not woven all in 2007, so off I went on my little trip and spent the day weaving for Mel. Mel is working frantically toward her exhibition opening. Its nice to watch another artist work, working proccesses are always interesting. mel is an excellent weaver and has so much knowlege to gleam, I always learn something new when I spend time in her studio. 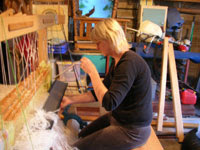 After her show I hope we can spend some time in my studio and get my big loom up and going. I didn't take any photos but I spent the day weaving a scarf for Melly. It was nice to get back at it and get the creative jucies going, mind you the loom was threaded and ready to weave no hard work to do just the good part. I hope to pop up again this week so will take my camera. 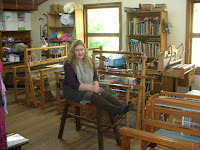 Well on Sunday 20th May I visited Mel in Mittagong at her weaving studio at Sturt workshops. It was a wonderful day. Julie Ryder came with me as There was an opening of an exhibition in the galllery New Directions, both Mel and Julie have work in the show, It is a wonderful exhibition and you should visit if possible. I have not had much time to weave latley I hope to visit with Mel on friday to weave for her. I am thinking of what work I would like to do. Mel always uses wonderful colour mostly rayon , silks and wool. We are thinking of exhibiting together,working with colour and texture Think Lacroix. 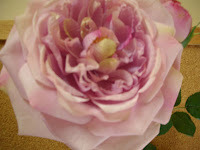 In Mel's book case is a paper rose and I am passionate about roses. The texture is like velvet and the colour can brighten your day, "luscious". Just think of a woven object with scrunch and texture ummmm! Now just one more image, I took quite a few on Sunday. Lines are one of the simplest marks you can make, and one of the most important design elements for a weaver. Since I have always enjoyed the math involved in weaving, I revel in the relationships and spacial tension between lines and in turn threads. 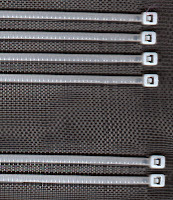 Weavers often learn to explore this through crammed and spaced warps where the warp threads are spaced at different widths apart. For many years, the work of minimalist and conceptual artist Sol Lewitt (who sadly died earlier this month) has been an irresistible attraction for me. He used his conceptual ideas with prescribed methods for series of combinations of lines and colours. For his line drawings and prints he believed that the idea and formula were to be distinguished from the personalization of the work. He used a prescribed formula (eg Squares with a Different Line Direction in Each Half Square Series 1971.) and often had others produce or install the work. "When an artist uses a conceptual form of art, it means that all of the planning and decisions are made beforehand and the execution is a perfunctory affair. His mechanical and removed ideas are easily relatable to weaving. The prescibed actions of planning the cloth which should, if proper notation is kept, be repeatable by anyone who understands the notation (this, of course applies mainly to production weaving, not hand manipulated work); the simplicity of the action of threading a loom; the consideration of colour, line and placement. Naturally, of course, as a hand weaver I manipulate, tweak and change the cloth as I weave; I am constantly evaluating as I work. In considering the ideal I take from the concepts of LeWitt, (apart from the beauty of his lines) it is that the consideration and structure of the art is just as important as the making of the work. 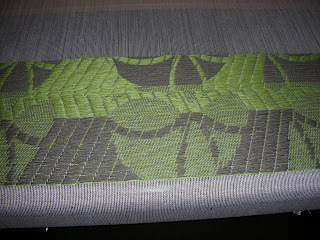 Please note - all images of woven samples in this entry are my own work and of my own design. Sturt Craft Centre is a collection of workshops (weaving, ceramics, jewellery, wood, photography) established in the 1940s. It was established with the ethos of adult education in practical crafts of high standard. Currently the weaving workshop is the only (I think) public access workshop of it's kind in Australia, with term classes and short courses throughout the year. hope you enjoyed the tour - check out the link at the side for more on Sturt. For some reason collage has always intimidated me... Then all of a sudden it just happened - it seemed perfectly natural for this concept. I mentioned in my last entry that I was working towards an exhibition in July. My work has always related to some sort of state of mind, even if that is just how I relate to objects. This work is about how your (or my) subconscious mind works in a dream state - so there are recurring themes, patterns, and everyday objects distorted and placed out of a normal reference point. I also love using stitching as a drawing tool, I think it harks back to a previous minimalism obsession. Can you spot the sprite bottle? Anyway, it has been incredibly fun, and it's a great excuse to horde a bunch of rubbish. Which is a strange state of mind to be in when I'm also going through an organisational purge - I have lovely new storage shelves and am ratting through all the boxes I've carried with me from house to house. Out with old, in with the new... hordings. What do you do with all the random stuff you've made in workshops years ago? You can't use it because it's impractical, but it's too big to store easily... in a shiny new box I think. And this is some of Belinda's work. 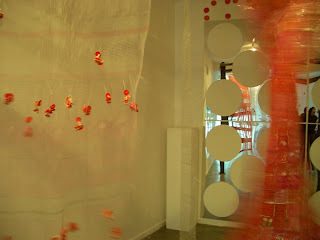 This collaborative installation is part of her Fybremotion work and partnership. Her work(on the left) is woven with transparent monofilament with hand embellishments in large panels that move when the viewer steps into an area of several motion detectors - a very surreal experience! I think we both enjoy the spontaneity and characteristics of working with synthetics - they seem to have so much energy and buoyancy. This is my favorite production scarf - 'Crinkle Scarf' in rayon and wool. It comes in whatever rayon colours I think of while I'm winding the warp, and I dye the wool after weaving so no two are ever the same. They make me happy and giggly - the rayon has so much light energy it just flutters around. I am currently working on my first solo exhibition which is coming up in July -eep! My loom has been having a few issues of late so production of any sort has been slow, even non-existent, but the issues have just resolved themselves (thanks to lots of help from friends) so I should be powering on quite soon.